LPLC’s mission is to conserve land and water in Lake Placid and the Ausable and Saranac River watersheds. LPLC works throughout the Ausable and Saranac River watersheds within the “blue line” that delineates the Adirondack Park. These large basins, outlined in red on the map below, cover more than 680,000 acres, and include approximately 327,000 acres of public lands and 330,000 acres of private lands. They host an array of economically diverse communities, scenic landscapes, wildlife habitats, farmlands, working forests, and wilderness that are connected by the flow of water through the watersheds’ many streams, rivers, ponds, and lakes, which ultimately flow into Lake Champlain. While most of the High Peaks in the Adirondack Park are permanently protected as Forest Preserve (shown in and on the map above), the majority of lowland forest surrounding the High Peaks is under private ownership (shown in on the map above). 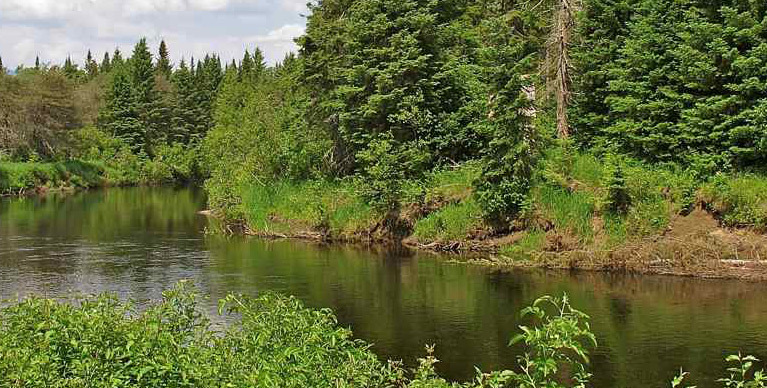 Lowland forest communities of the Ausable and Saranac River valleys contain some of region’s greatest biodiversity but are also subject to the greatest development pressure. 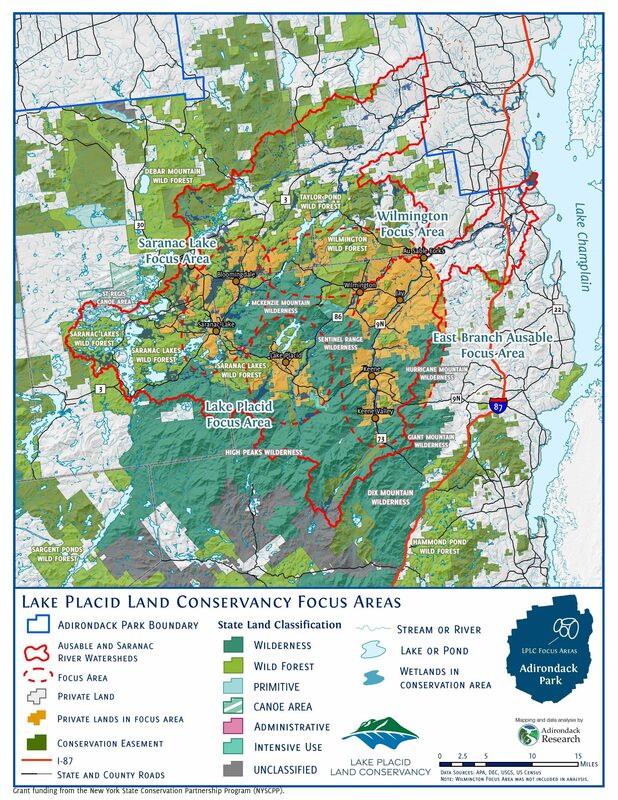 Lands surrounding Lake Placid and the upper West Branch of the Ausable River; lands between Lake Placid and the High Peaks and Sentinel Wilderness areas. Lands in the East Branch River valley and around the Jay Mountain Wilderness area, including the Route 9N travel corridor between Upper Jay and AuSable Forks; lands between Giant and High Peaks Wilderness areas along the Route 73 travel corridor from Keene Valley to Keene. Lands around Saranac Lake northwest to Gabriels and north to Bloomingdale, including the Saranac River valley and the Route 86 and Route 3 travel corridors. Lands along the Route 18A travel corridor and the Saranac River valley around Franklin Falls. Continued protection of critical open space and wildlife habitats on private lands in the focus areas is still needed, especially along lakes and river valley bottoms where development could have particularly severe impacts on scenery and wildlife, and also contribute to flooding, and pollution in lakes, rivers and streams.